[UPDATED] Finnish competitiveness: what are we talking about? Update 6.3.2014 I think this article on competitiveness by Ronald Janssen is very informative in relation to the issues below: yes, Finland has become weaker in terms of price competitiveness, but traditionally Finland has competed with quality rather than price. This is an explanation of the success of e.g. Kone, the elevator company. So in this sense I stick to my conclusion. In this post I use the AMECO database, which is apparently in heavy use with some economic policy institutes. In the recent centralized incomes agreement the most emphasis was put on wage moderation. 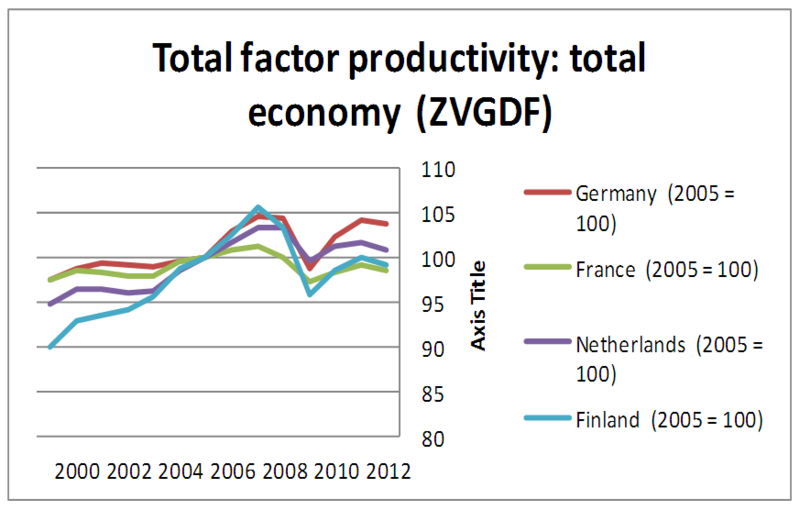 As I tried to argue here, for Finland it might be better to focus on domestic demand than international competitiveness. 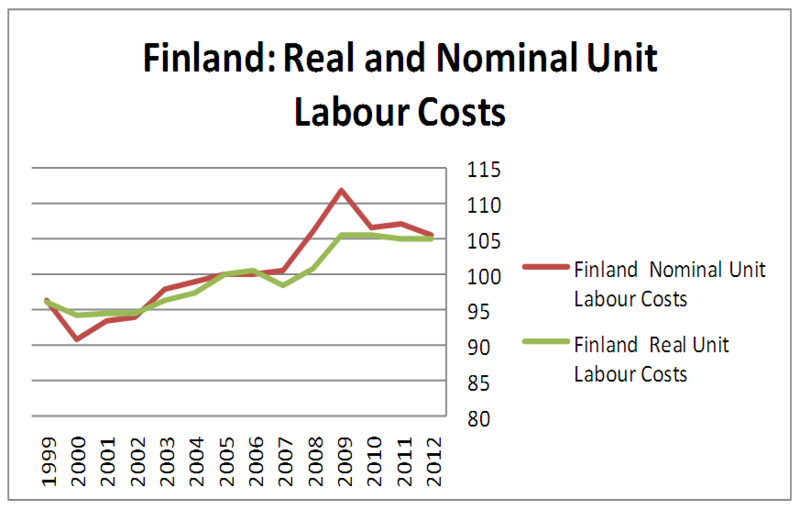 There are two reasons for this – it seems that domestic demand is more important for Finnish GDP growth than is apparent, and second, although Finland competes with Germany in terms of quality goods, it loses out in terms of labour costs (which is a point made by Finnish industry for a long time). In this post I showed Finland’s balance of trade with the EU (which has been worsening over time). In this post I wish to focus a bit more on these issues by using different data. 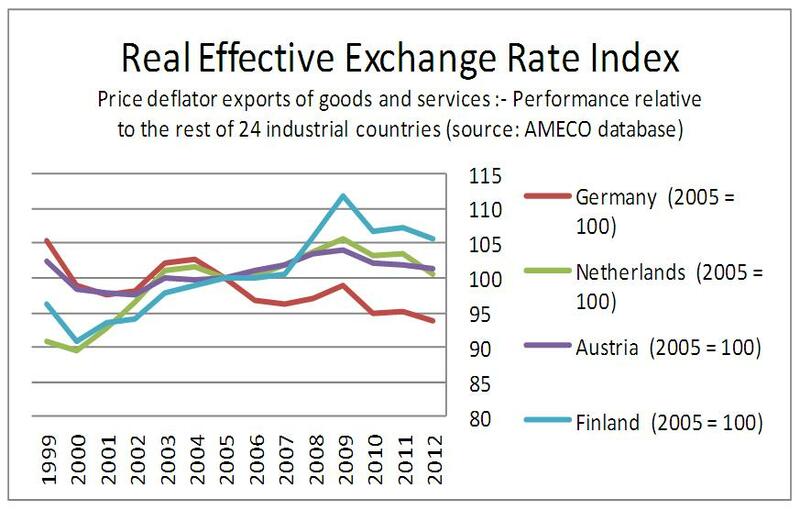 The AMECO data offers a useful function to ‘weigh’ indexes by a price deflator based on various competitor industrial countries, so to make the indexes more fair and reflecting ‘reality’. First, the Finnish real effective exchange rate. 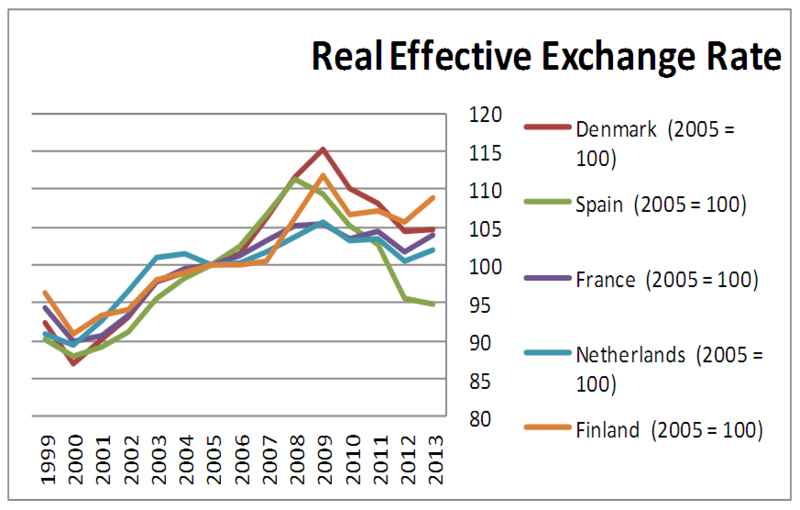 The data for 2013 are estimates, but it is clear that for these countries, only the Spanish real effective exchange rate is improving. This is perhaps reflected in the recent news about Spanish exports. So given this real effective exchange rate, it is not impossible that the balance of trade worsens still, but it can also balance out because of declining domestic demand (which would shrink exports as well). In any case, it looks like Finland fits better with this group of countries than with the countries in the previous graph. 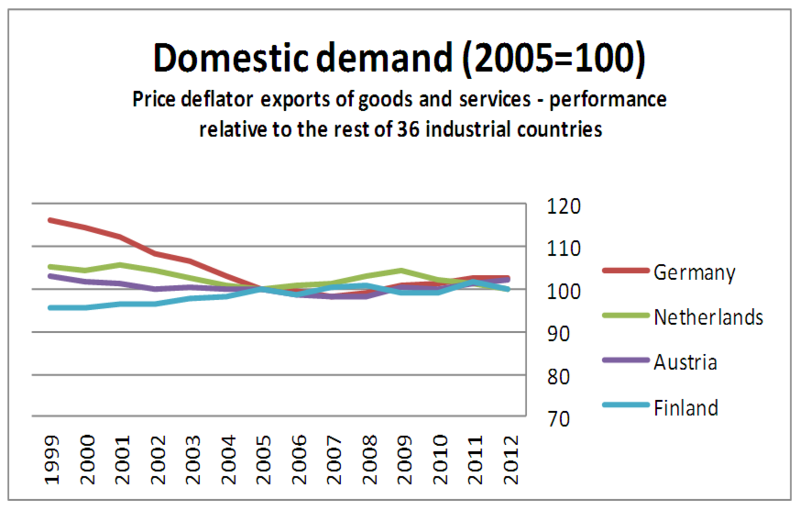 Domestic demand in these ‘core’ countries has been quite stable although Finland seems to be sloping downwards since 2011. In this context, it is not such a good thing that purchasing power will shrink somewhat (or even more than earlier announced) with the new centralized agreemend (in Finnish). The decline in domestic demand in Germany is quite remarkable; this is what Bibow has indicated as a consequence of Germany’s export-led growth model. In this context, where are we considering nominal and real unit labour costs? 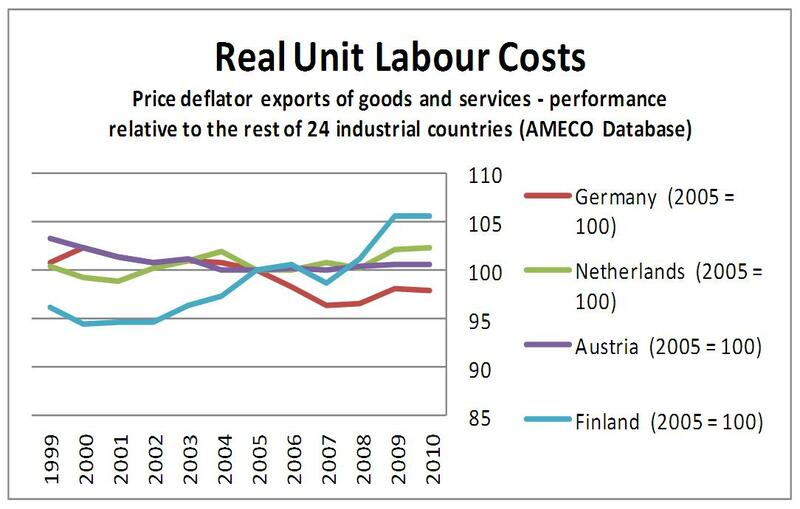 In other words, real unit labour costs have stabilized since 2009. 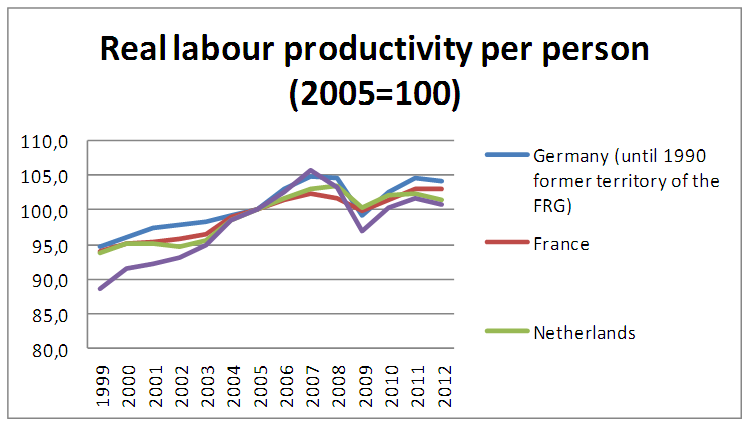 But the ‘problem’ is that Germany still has a much lower RULC, thanks to years of suppressing wages (AKA wage moderation). Summa summarum it is very honourable that the Finnish labour market partners have concluded a labour market agreement that fits the bill of the discourse (competitiveness, wage moderation). But in the end it would demand much more in terms of ‘internal devaluation’ to get even with German RULC. And it is a rather big iffy question whether Finnish domestic demand can handle that, given that unemployment is already high and every day there is news about redundancies. So yes, I understand that export firms are worried about their competitive position but there is actually not that much that can be done. 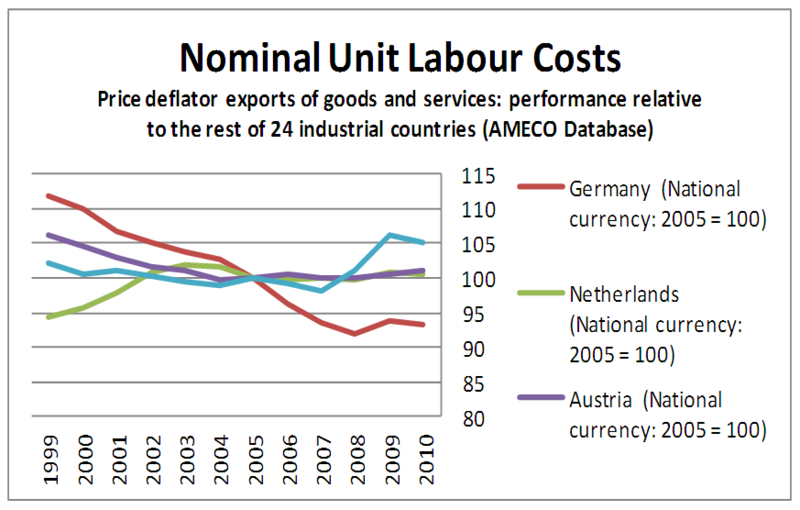 Essentially the options are cutting wages drastically (politically unfeasable and immediately recessionary) or simply focusing on things other than price, regarding export sectors – especially since German real unit labour costs still may be falling. The Finnish export sectors are known to be the ones which have been able to negotiate high wages (but not necessarily higher increases), so any attempt to adjust labour costs to lower levels would start there. The problem is that in these sectors, the labour costs are usually not the largest costs at all, which may mean even a sharp reduction in wage costs may not affect total costs that much. 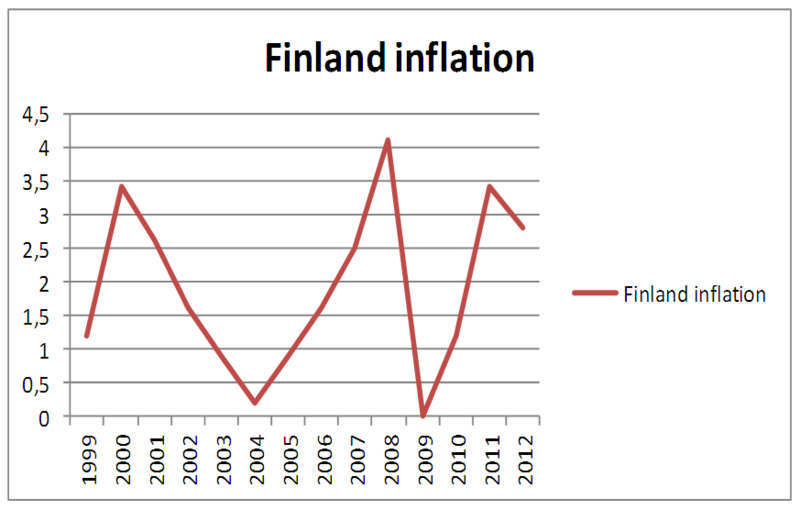 This entry was posted in Economy, Eurocrisis, Finland and tagged AMECO Database, competitiveness, Finland, RULC, wage moderation. Bookmark the permalink.